Tollywood two superstars of different age - Soumitra Chatterjee and Prosenjit will be seen together in Atanu Ghosh's upcoming Bengali film Mayurakshi. Soumitra will be screen father of Prosenjit in film Mayurakshi. Film Mayurakshi deals on father-son relationship at different ages. In film Mayurakshi, Soumitra Chatterjee is a professor. Story of the film Mayurakshi is written by Atanu Ghosh himself and the storyline is influenced by his own experience. Atanu Ghosh's father was a professor of Physics and during his last stage of life, the professor was very ill. Atanu Ghosh used to spend one to one and half hours daily with his father daily during those days discussing on many topics. 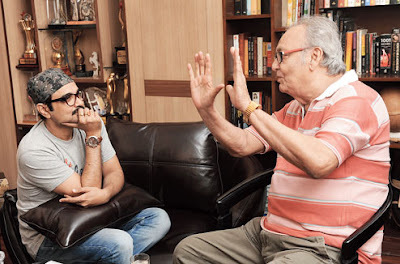 Soumitra Chatterjee has worked with Atanu Ghosh in six films so far.